Don't judge an amp by its cover. Sometimes, you just need noise. Good, old-fashioned, wonderful noise. No Bluetooth, no cute input lights, no digital displays. Just a big, grunting monster of an amplifier that you can use to mess things up. In those circumstances, you turn to a company like Canada’s Bryston, and ask them to send you something like the B60R. In this review, we break down the B60R’s sound, design, packaging and accessories, specs and more. To see how it stacks up, see our list of the best stereo amps. You don’t choose the Bryston B60R for its design. You get it for one thing, and one thing only: the sound quality. This thing sounds unbelievably good. Sure, for those in the audiophile crowd used to five and six-figure integrated amps, that’s probably not the case. But for just about everybody else, it stands head, shoulders, chest and waist above virtually any amplifier out there. Even despite the fact that it’s nearly a decade old; while the company has put out plenty of variations since then, this is still very much at the top. Or close to it. 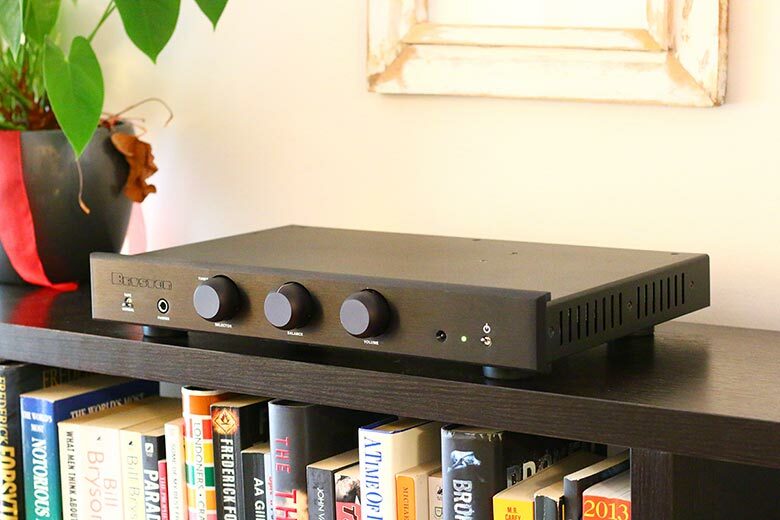 In the time we had this amp, we tested it on a number of speakers, including a very slick pair of MarkAudio-SOTA Cesti Ts (full review here). We cranked it loud, we dialled it down, we let it run for hours at a time. We put every genre we could think of through it, including some we’d never even heard of. We gave this amplifier one hell of a thorough testing. And it absolutely knocked it out of the park. What impressed us most about the sound was the raw power. It’s not the loudest amp available, with 60 watt RMS at 8 ohms, and 100 watt into 4 ohms – compare that something like the cheaper Peachtree Audio nova300, which offers 300 watts into 8 ohms - and costs $2,199 to the B60R's $3,385. But it had such unrestrained energy to it. The sound coming from the speakers leapt, kicked, snorted, and roared. It was endlessly exciting and bursting with energy. This is the kind of thing that Bryston are really good at: pulling the absolute maximum energy out of their components. This might be a four-figure amp, but rest assured that it absolutely puts out a four-figure sound. It’s also surprisingly neutral and balanced, not coloring the sound much. It’s the kind of amplifier that would work just as well as a power amp - if you choose to use it that way - able to deliver audio to even the hungriest of speakers without messing with the sound too much. The dynamics are just stunning, and, throughout the whole review period, we really felt that we were getting the best out of our speakers – whether they were $4,000 three-ways, or simple bookshelves. There’s a very good reason why this amplifier is still popular, and you only need to listen for a short time to understand it. Compare it to something like the more expensive Anthem STR ($4,499 to the Bryston's comparatively slim $3,385). You would never catch us saying that the Anthem isn’t a good amp. It’s an excellent amp - and a more powerful one, with a 200 watt output. And yet... We prefer the Bryston. A little bit about the functionality the amp offers: Outside of the inputs and outputs already mentioned, you do get a couple of additional ways to experience its awesome sound. If you have a recording setup, you can quite happily integrate this into it, using the Tape Loop setting. For the majority of people, this option will probably remain unused, but it’s nice to have, nonetheless. There are also two U-shaped gold connectors linking the pre and power amp in/outs - removing them allows you to separate these two sections. This means you can integrate a receiver into the mix, while still being able to use the controls on the front of the unit. This is similar to features seen on other amps, like the Parasound Halo Integrated. Not having a recording studio on hand, we didn’t test the tape loop option, but we did test the pre/power separation, and it works just fine. It offers a slightly superior audio experience for a lot less money. No, it may not come with a DAC. Yes, it may be a little old now. And it’s certainly no looker. But there’s just something about its sound that we really grooved with: an indefinable combination of detail, power, and style that just worked for us. We will happily argue in the comments below about the relative merits of this amp compared to others, and whether it’s been superseded over the years, but you should know that we plan to stick to our guns here. This amplifier sounds terrific. So, here’s what you get when you drop close to $3,500 on this monster of an amplifier. You don’t get looks, that’s for sure. This is not a pretty amp. You know the wonderful design of similarly-priced amps like the Peachtree Audio nova300 (full review here)? Forget about it. This is the apotheosis of function over form, where everything – absolutely everything – is designed for putting out the best sound possible. The no-frills design certainly gets things done, but, if you want something that’s pleasing to the eye, you might as well stop reading here. It has a fairly slim housing (no more than a couple of inches high) and a basic front end. You get three prominent knobs – an input selector, a balance control, and volume control. There’s a 6.3mm headphone connector, and two clicky little switches – one for the power, and one to activate the tape loop. Round the back, unsurprisingly, you’ve got a comprehensive set of inputs and outputs, including connections for CD, tuner and Aux, as well as a pre/power connection, and speaker binding posts - nothing we wouldn’t expect to see on other big-name stereo amps. And that’s it. In its entirety. You plug it in, and start using it. There’s no digital display, no Bluetooth, no lights that change colors depending on what filter is plugged in. This is an amplifier built by engineers - ones who are concerned with a single question only: does it work? It’s the same ethos that the company has had for years, and it carries through to their more recent projects, like the BryFi (full review here). Like the B60R, the BryFi sacrificed everything for functionality, with almost no thought given to the actual appearance. We consider that a bad thing – we like our audio gear to look good, as well as sound good – but something tells us that the target market for this particular amplifier doesn’t really care. While you might not get award-winning design, what you do get is some truly brilliant build quality; in this regard, it actually beats models like the aforementioned Peachtree Audio nova300. You can get an idea of this by turning the knobs on the front. The input knob has a clunk that feels satisfyingly weighty, and the volume and balance knobs move well in the hand. The speaker binding posts seem like they could stand being battered through a wall, and the entire amplifier itself feels like you could drop a brick on it, and not have it stutter. While we didn’t actually do this – because, come on – there’s no doubt that the engineering used to create this amp was second to none. It might not be $3,500 aesthetic design, but the build quality certainly lives up to the price. And, if you think any of this is superficial, just take a glance at the warranty. The company offers a warranty of twenty years on the amp. That is, by quite some margin, the most generous warranty we’ve ever seen. Although we didn’t have the amplifier nearly that long (obviously), we’re pretty confident in saying that this thing might never break. Say what you like about Bryston – we sure have – but they stand behind their product. Let’s compare that with another amp maker, Schiit, who aren’t exactly stingy with their warranty. They offer five years - itself very generous. You can read our take on one of their amps here. From the heights of sound quality, we descend – once again – into the lowlands of terrible design. Well, not terrible: just a little boring. While other amplifier makers put a bit more work into the packaging – those from Chord Electronics come to mind – Bryston definitely doesn’t. You get a cardboard box with the amplifier held in place by foam inserts. That’s it. If you’re looking for flash, you’re definitely not going to find it here. You also get almost no accessories beyond a power cord. You can, if you’re so inclined, get a remote control to go with your amplifier. This didn’t come in our testing package, unfortunately, so we can’t really say much about it. The B60R has powerful, inspiring sound that remains excellent years after it was released. ​The dynamics are tremendous, and they really bring the music to life. Build quality is among the best we’ve tested, in any product class. It’s built like a tank. You get an unbelievable warranty of twenty years. If your B60R breaks, we would be astounded. The B60R has a seriously boring design, and will almost inevitably fade into the background. There’s no included DAC - although that's hardly a dealbreaker. ​If we’re being picky, it would have been nice to see some additional accessories. Peachtree Audio nova300 $2,199 17lbs 300W/8Ω Yes 400W/8Ω 14.8" x 13.25" x 4.4"
Anthem STR $4,499 40lbs 200W/8Ω Yes Unknown 17.5" x 17" x 6.3"
Bryston B135³ $5,995 26.5lbs 135W/8Ω Optional Unknown 19" x 14.6" x 4.5"
The Peachtree Audio nova300 (full review here) is probably the only amp in this price range that can beat the B60R – and, while we love the latter, this is definitely the one you should go for. It takes everything the Bryston does so well – the functionality, the build quality, the stunning sound – and launches it into orbit. It looks good, and sounds fantastic. It’s also more powerful, with a 300 watt RMS. While that might put it out of range if you have speakers that don’t require a ton of power, the amp also delivers some of the best value we’ve ever seen. Between this and the Bryston, your amp needs should be covered until the end of time. Then there’s the Anthem STR. This enormous bruiser is quite a bit more expensive than the Bryston, and we don’t think it beats either that amp or the Peachtree, above. But that doesn’t mean it’s not great. Far from it. The STR is still one of the best amplifiers available, and, if you want something that can deliver a ton of power while looking really good, you should check this out. It comes with a built-in DAC that can handle DSD files, and even has room correction built in – although, the sound without it can be a bit lackluster. All the same, if you have some more cash to burn, check this baby out. A final competitor: the Parasound Halo Integrated. It’s the dark horse of this particular collection. Parasound aren’t as well-known as Anthem or Bryston, but perhaps they should be: their Halo Integrated is magnificent. It’s slightly cheaper than the Bryston, by about $900, and, although it has a few more bells and whistles, we think the sound of the Canadian amp is a little bit better. There’s also the fact that the Halo can be tough to find, unless you know where to look. If it does interest you, it might be worthwhile going direct, or nipping down to your favorite hi-fi store. It’s also worth mentioning another Bryston amp: the B135³. While we prefer the B60R for sheer timelessness, this is also a solid amp. It’s a grunter, with 135 watts of power, and a significantly-enhanced front end that is a lot more complex than the amp under discussion here. It’s also way more expensive, at close to $6,000. At that price, there are better options available, like those from McIntosh. But back to the B60R. You know what we’d compare this amplifier to? The Sennheiser HD600 headphones. Those cans were released ages ago, but are still huge sellers, and still appear in home-made mods. For many listeners, they are the gold standard by which any new headphones are judged. While the B60R isn’t quite in the same legendary company, we think that, perhaps, it should be. It has a combination of power, subtlety, and addictive audio quality that, even a decade later, remains virtually unchallenged. That’s why we’ve ranked it so highly in our best stereo amps list. We’ve even placed it above models from manufacturers like McIntosh, Anthem, Rotel and Marantz. It’s the amp that keeps on giving. It’s a real workhorse that will never quit on you, that will power anything you throw at it, that will keep delivering excellent sound for a good twenty years down the track. We aren’t joking when we say this is still one of the best amplifiers available, and, if you really want to invest in your system, it’s one you should absolutely consider. Unless, of course, you want it to fit with your decor. Then you’re out of luck.